this amazing shoes. i like it. Clever design on the back of the sneaker-at 1st I couldn’t see the letters/numbers/punctuation marks/symbols, etc on the sneaker. The manufacturers should have made the “keyboard” a different color than the rest of the sole. This unique design may have been inspired by the overwhelming popularity of computers; I’m assuming that’s why the manufacturer did what he/she did. Probably exorbitantly-priced for something no one sees! Out of curiosity, I wonder what they charge for them? Also, what part of the US was this concocted, or was it conjured up overseas? L’ha ribloggato su The Brontolon Post. 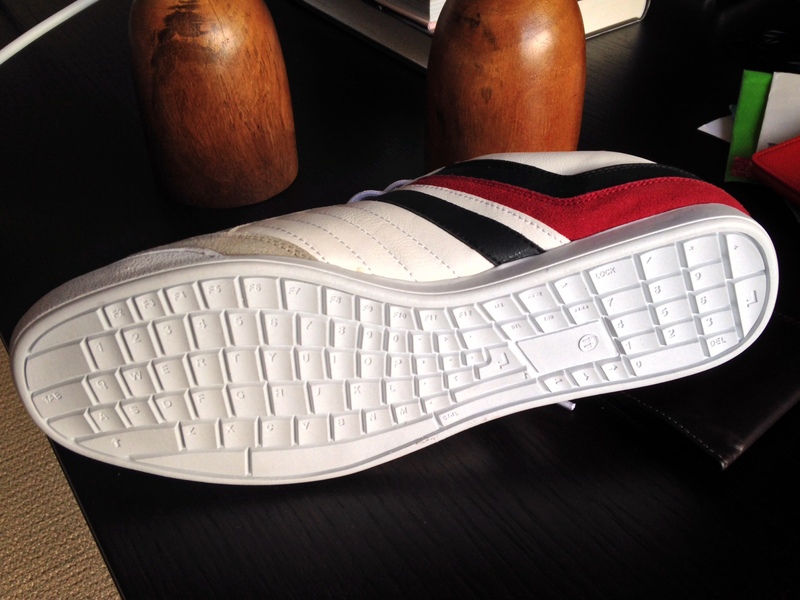 Keyboard shoes. This is actually real life right now. Reblogged this on Dominik Kilpatrick. Even the space bar is on them!! Maybe it would be a better idea to just use them as a nick knack, not as footwear-keep them clean & just put them on a shelf to use as a conversation piece, so neighbors/friends/family can talk about the “keyboard” shoes-except change the color of the keyboard so they’d be able to see it right away! The person who designed them is very creative! Having the keyboard a uniform color to the rest of the sole just didn’t make very much sense-(only creative error). This is a very clever idea. I want it !!!!!!!!!!! Reblogged this on Page Book Journal. Yooooooo this is so dope!!!!! A little bit of style and function. This keyboard is just too funny. Yes, “inking” the soles in a temporary product and printing them in unusual places,like ceilings with the help of someone holding you upside down or an oversize mouse pad, etc, would definitely imprint conversation. interesting…..more better if colourful keyboard!!!! Looks like a man’s shoe because it’s so big, & men usually have bigger feet than women. I thought this was totally cool!!!! cool, i want this shoe! Maybe a better idea would have been for the design of the keyboard to be on both sides of the shoe so it could be seen. (Perhaps part of keyboard on one side/the other part on other side of shoe). It would probably have to be imprinted super-tiny, but the entire keyboard design either just one side or both sides of the sneaker, but would work better if the “keyboard” was a different color than the rest of the shoe, like I mentioned before, so it would be readily apparent what the design is. Almost no one looks at the soles of a shoe/sneaker, obviously, since that’s where everyone walks. Sorry about the typo – I meant I have nominated you for the award. Reblogged this on legendwhale's Blog. Гуд блин. Ни фига не понимаю по английски, но давай будем друзьями- френдами. If you press the SHIFT key does it turn into a boot? Not sure what it is or how it works but I like it! That is the Funkiest thing i have seen! LOVE this. Definitely needs to be made for women’s running shoes as well! I’m sharing this because I love this! Hit like if you would buy this to use on a your PC? nossa q legal, eu adorei !! I need this! It’d match my current bike grips!